St. Petersburg is a city very unlike the traditional Russian cities. From the first years of its emergence to our days, St. Petersburg played a prominent role in the political and cultural life of the country. Petersburg itself is a city-tourist attraction. For a long time the city on the Neva was the capital of the Russian Empire, in its magnificent palaces, in aristocratic lounges, secular life was boiling in clubs, and the granite Petersburg embankments remembered the traces of many musicians, writers, political, scientific and public figures. In the city there are a number of apartment-museums, including A.S. Pushkin, F.I. Shalyapin, IA, Brodsky and many other talented people, whose life was for some time connected with St. Petersburg. St. Petersburg has always been considered an aristocratic city, refined and noble. Not for nothing and today St. Petersburg is among top as the most popular cities in Russia. You can see the sights of St. Petersburg not only with a guide, but also independently. The city was built according to a well-thought-out architectural plan, and now this fact makes it much easier to get acquainted with St. Petersburg even for those who came to it for the first time. But you can admire St. Petersburg not only from the land, numerous channels and channels of the Neva allow you to make unforgettable walks along the city's waterways. Not only the man-made sights of St. Petersburg deserve admiring responses. In June in St. Petersburg you can observe such an amazing phenomenon as the white nights - at this time in the city especially many tourists, and the period of white nights is considered a "high" tourist season. Features of the area in which St. Petersburg was built, together with the imagination and skill of the builders and architects, created a city that was called the Venice of the North for a variety of picturesque canals, embankments, bridges. Among the well-known historical and cultural monuments of St. Petersburg are the Hermitage, St. Isaac's Cathedral, the Mednyy Horseman and other objects. 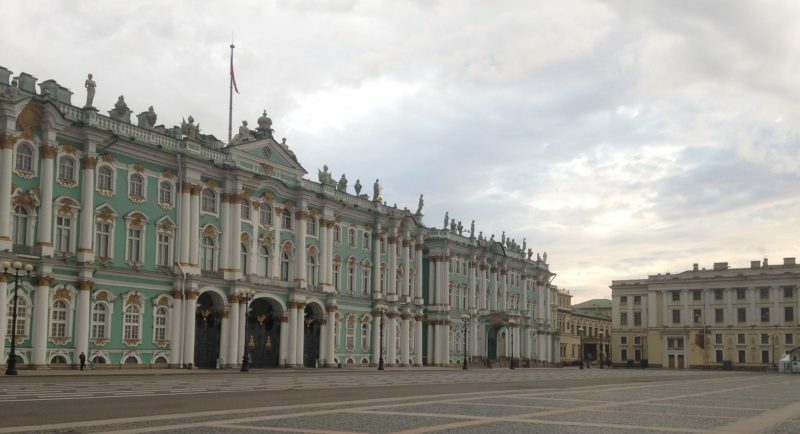 The Hermitage is one of the largest and most famous museums in the world. In his collection, paintings of famous artists of the past, sculpture, including antique, medals, jewelry from precious and ornamental stones. Having begun its existence as a private imperial collection, during the reign of Nicholas I, the Hermitage became a public museum. Monument to Peter I - who is often called the Mednyy Horsemen by the name of the eponymous poem by A.S. Pushkin, has become a very recognizable monument, a kind of symbol of the city, which often imprinted on postcards, illustrations. For tourists who are interested in the history of St. Petersburg, it will be useful not only to see this monument, but also to learn how it was created - its fate was full of twists and turns. Usually many people who wish to visit the Kunstkamera are a cabinet of rarities, especially an anatomical collection. Separate from others are the suburbs of St. Petersburg. Peterhof, Gatchina, Pushkin, Strelna, Kronstadt - there is hardly a person who has not heard about them, of course, referring to the inhabitants of the post-Soviet space and the citizens of Russia. Unique gardening complexes and the palaces of these Petersburg suburbs accept the incessant flow of tourists from around the world. In the city limits of St. Petersburg there is also an impressive number of palaces. Of course, the most famous is the Zimniy Palace, with the Dvortsovay Square adjacent to it and the Alexander Column. Less known, but noteworthy Mariinsky Palace in St. Petersburg, Anichkov, Tauride Palace, Mikhailovsky Castle and others. In St. Petersburg there are more than 10 large parks and gardens with an ancient history, whose age is estimated not by one decade, but some by the century. Tavrichesky garden appeared in the estate of Gregory Potemkin in the late 18th century, the Letniy Garden, laid down by the order of Peter I appeared even earlier - in 1704. The younger ones are Catherine and Mikhailovsky, the Mars Field . Once upon a time ladies with umbrellas walked armily with gentlemen, but nowadays parks in St. Petersburg serve as a popular place for rest of townspeople and tourists. Of course, St. Petersburg - a major cultural center, which is an active creative life. Petersburg theaters are known far beyond the city limits, and some - and Russia. Mariinsky Theater, philharmonic society. Dmitry Shostakovich, the Opera and Ballet Theater. Mussorgsky is just a short list of theaters in St. Petersburg, which music lovers, vocalists and choreographers can visit. Many streets, avenues, canals and bridges have become not only architectural sights of St. Petersburg, but also heroes of literary works, songs and poems. Nevsky Prospekt and the Griboedov Canal, the Fontanka and Moika rivers can be found in the books of the classics of Russian literature, and in our time the streets of St. Petersburg often become a film set for modern movies. One of the very first buildings that appeared in St. Petersburg - the Admiralty, the first version of the Admiralty appeared in 1704, then, in 1730, a stone building was built, later the Alexander Garden was broken up. Admiralty is often included in the number of objects that tourists are visiting during excursions around St. Petersburg. Not so long ago, a very important sight of St. Petersburg, a "living" participant in historical events, was considered to be cruiser Aurora - it was from him that a volley that laid the foundation for a new era in the life of a huge state. And in 1941, during the Great Patriotic War, artillery guns were placed on Aurora, and she took a direct part in the defense of the city. Some of the sights of St. Petersburg create certain problems for the residents of the city, but cause genuine enthusiasm among tourists - we are talking about drawbridges. The night breeding of bridges for the guests of St. Petersburg becomes a memorable and romantic spectacle, which must be seen.